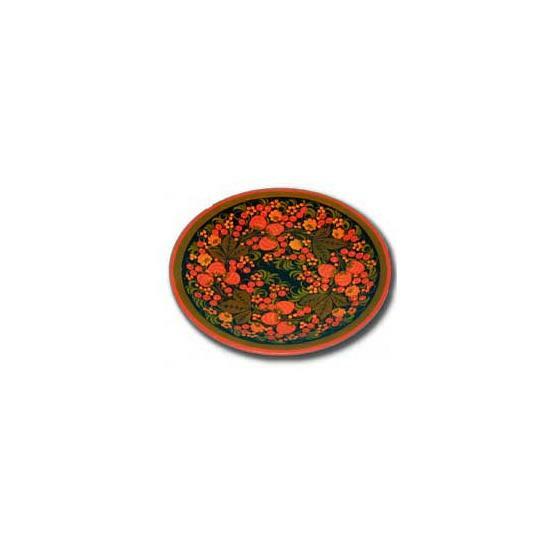 Authentic Khokhloma plate handmade in Russia. Khokhloma painting on wood is a traditional type of Russian decorative work that was started in the second half of XVII century on the territory of what is today called Koverninsky region of Nizhnii Novgorod oblast. The name of this type of painting was given to it after the trade village of Khokhloma - also located in the Nizhnii Novgorod oblast. Khokhloma painting (or Khokhloma) is characterized by the original technology of painting wood gold without the usage of the metal itself. 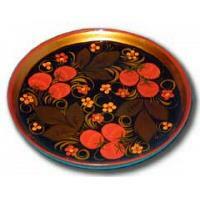 Various combinations of such colors as red, black and golden are characteristic of Khokhloma painting. Height: 9.8" (25 cm). Production time: up to 7 business days.